In the few weeks since my husband resigned his position as pastor of our previous church, he has filled out many a job application. He’s even had several interviews. And I have to be honest, claiming God’s promises to provide for His children was a lot easier when we still had extra money sitting in the bank. 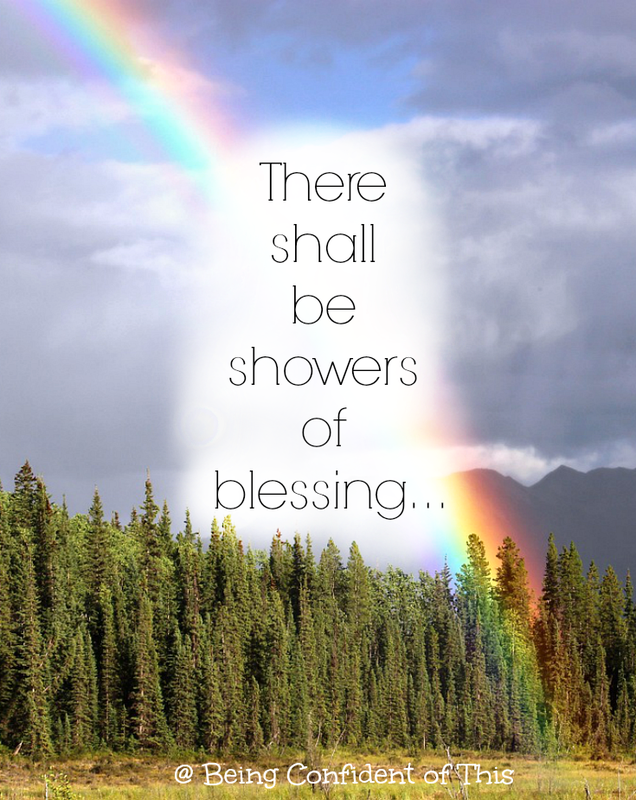 It’s easier to trust Him for showers of blessing when we’re not quite in drought yet. I knew that this moment would come when our faith would really be put to the test. Now is the time when the money is no longer coming in, the time when the savings account is running woefully low. Yet now is also the time when we see the very hand of God act on our behalf in both big and small ways! It’s true, friends, that in the midst of this season of trial, we are reaping a multitude of blessings. Not just mercy drops, but showers! I’ve been longing to keep record of the showers here in this space as stones of remembrance that I can look back on. So here goes. 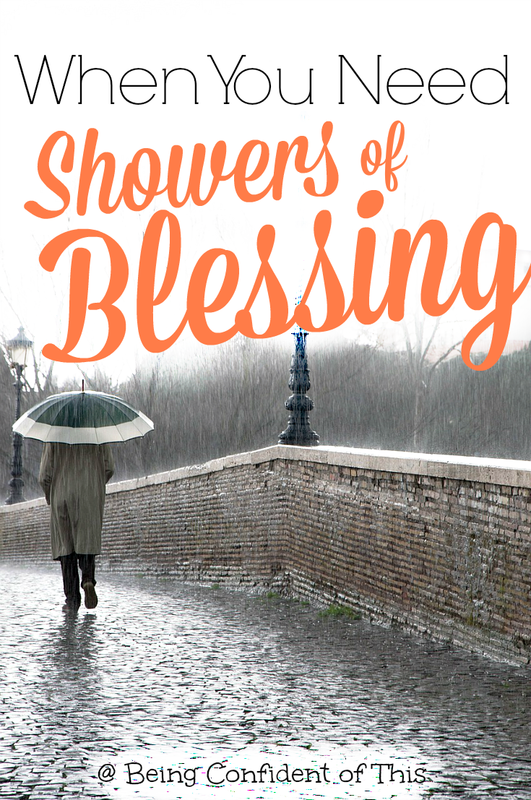 Not just a handful of blessings, friends, no – showers of blessings! So often I am quick to ask the Father to provide for big, noble, spiritual needs – like funding for church planting or for a missions trip, etc. Then when it comes to smaller needs or things that might just be selfish wants, I’m afraid to ask. I fear that my reasons aren’t “spiritual” enough, so He might choose not to provide for them. How about you, friend? Are you ever afraid to ask? When I think on the line above, I’m reminded that God is my Heavenly Father and a father’s main role is to provide for the spiritual and physical needs of his family. My husband certainly desires to meet all of our children’s needs whether big or small and yes, even some of their wants, too. Yet we are earthly, human, imperfect parents. 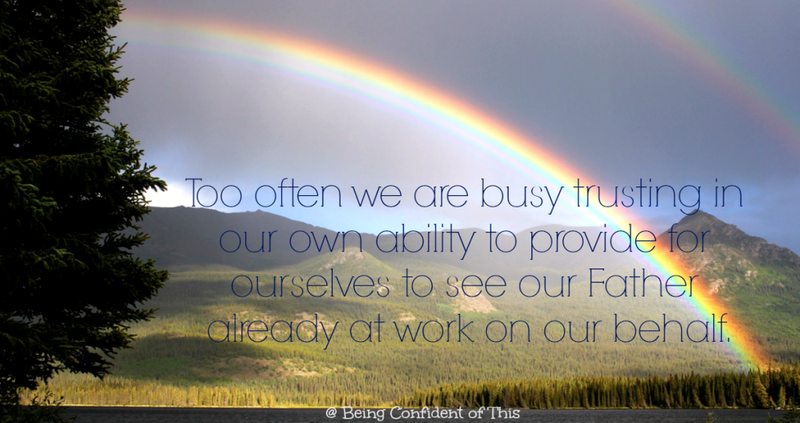 Too often we are busy trusting in our own ability to provide for ourselves to see our Father already at work on our behalf. It’s only when we are incapable, when we have no way to meet our needs on our own, that we finally turn to Him and ask. When will I learn? 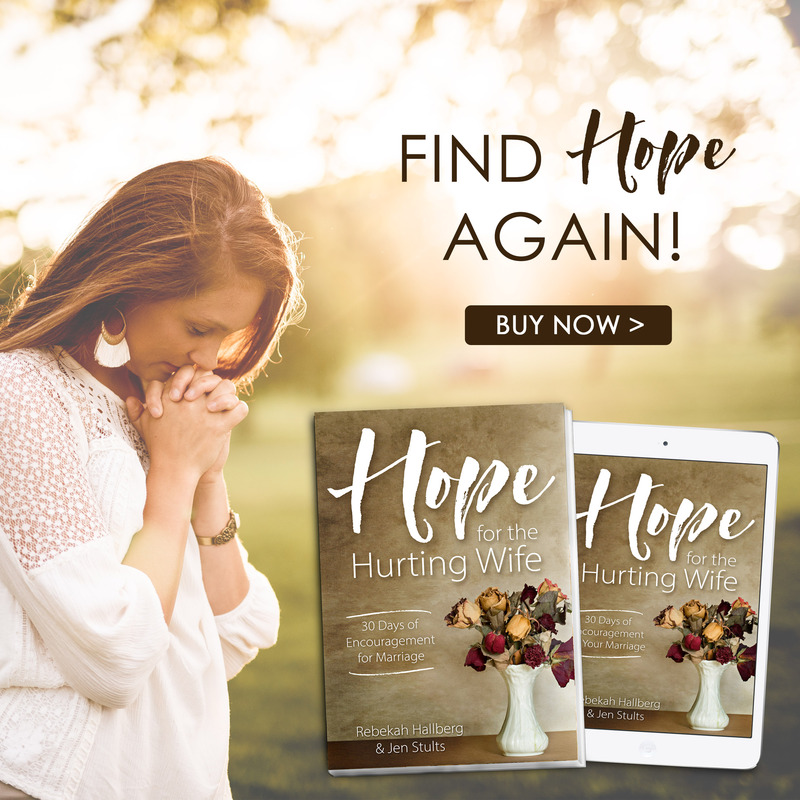 When will we learn that God is the Father who is not only capable, but also willing to provide all that we need, and even some things that we simply want? I’m not talking about asking the Father to make us millionaires or provide for worldly extravagances (although sometimes He likes to blow our socks off with an extravagance, doesn’t He?!). before we sink into panic mode! 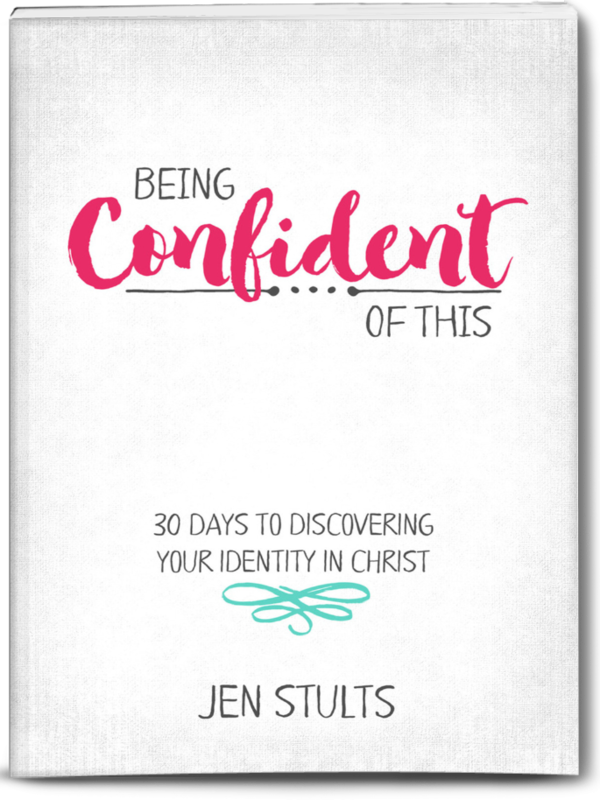 What if we just asked Him first and trusted in His character as our loving Father, as Jehovah Jireh, the God who provides? I’m betting we’d see more miraculous answers to prayer than we’re used to. The right jobs for us and a partial new roof before winter. Praise the Lord along with us, friends! But for the showers we plead! It’s almost here: Sunday, a day when brothers and sisters in Christ from around the world gather together to worship the one true God. And this Sunday, I will be able to go to church! Isn’t that exciting?! I’m ready, ready for worship, for fellowship, even for conviction to sting my heart during worship. I’m ready for serving, for listening, for both giving and receiving. I’m ready for hugs and how-are-yous and happy-to-see-you-todays. I’m so ready that I would love to skip right over Saturday straight to Sunday! I wish I could say I felt this way each and every Sunday, but the truth is that I don’t. Many Sundays, I would rather not attend church. I would rather not serve or worship or fellowship. But on those Sundays when I grudgingly rise up from bed and grudgingly head out the door to church, I’m the loser, the one who misses out. There is nothing different about those Sundays except for my own attitude. I take worship for granted and fail to see it for the privilege that it is. Thus, I miss out on the blessing church attendance could be. It’s funny, really, how an illness or injury or absence of any kind can help you to appreciate those things in life that sometimes feel like burdens rather than the blessings that they truly are. Like family. Like motherhood. Like worship. Like serving the Lord. We who are in Christ, especially here in America, are blessed with so many privileges that we fail to see as such! 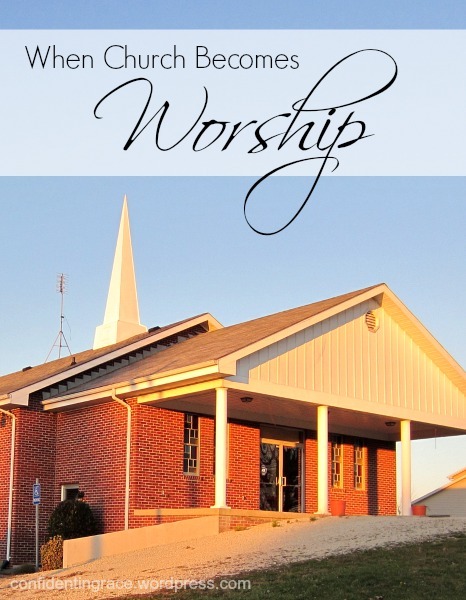 When does church attendance become a burden? When do we forget the blessing of knowing God, of being chosen? When does spiritual life become less razzle-dazzle and more ho-hum? It happens when we forget who we are and who He is. Because when I remember what an unworthy sinner I am, how flawed, how small, how unlikely to be chosen, I know my real place. then I leap at the chance to give Him the praise He is due! I’m reminded, too, that I live in America, the land of the free, while so many of my brothers and sisters in Christ around the world do not share in that privilege to fellowship and worship without fear! In fact, nearly a third of the world does not even know the truth of a Savior who willingly bled and died for the sake of our redemption from sin and slavery. And with that perspective, the opportunity to worship with fellow believers becomes a blessing and not a burden, a delight rather than a duty. That’s when church becomes worship. I wish we who are in Christ could feel this way about a chance to worship Him in church every Sunday! How powerful would that be? Even if our church isn’t perfect (and which one is? ), even if our relationships aren’t perfect (yes, those, too), even if we aren’t perfect (and no one is, no, not one), our God is perfect. Does He not deserve our adoration and obedience? 22 let us draw near with a sincere heart in full assurance of faith, having our hearts sprinkled clean from an evil conscience and our bodies washed with pure water.